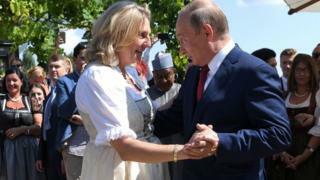 Mr Putin gave her presents and danced with her at the event in the southern Austrian province of Styria. Mr Putin stopped in Austria on his way to Germany, where he held talks with Chancellor Angela Merkel. Ms Kneissl, 53, married entrepreneur Wolfgang Meilinger, 54, at a ceremony in the small town of Gamlitz, near the border with Slovenia. Mr Putin arrived with a bunch of flowers for the bride and was accompanied by a troupe of Cossack singers who performed for the guests. His spokesman Dmitry Peskov told Russian media that he also presented the newlyweds with a painting of village life, an antique oil press and a samovar, an urn used to prepare tea in Russia. Mr Putin gave a speech in German and toasted the bride and groom, Mr Peskov added. Ms Kneissl, an academic with no party affiliation, was picked as foreign minister by Austria's far-right Freedom Party - a coalition partner in the current government. The Russian president was invited during a visit to Austria earlier this year. Mr Peskov said Mr Putin "shared a passion for judo" with Mr Meilinger. There has been vigorous debate in the Austrian media about the Russian president's appearance since it was announced this week. In Germany, the Russian president held informal talks with Mrs Merkel for three hours at Meseberg castle, north of Berlin. They were due to discuss Syria and Ukraine, as well as Russian gas supplies to Europe. The meeting ended without a news conference. Mr Putin later flew back to Russia.